The procedure of the piston cylinder is the same as of the displacer cylinder except the fins as we want cooling at piston cylinder. So during CAD modeling you need to create fins by using pattern feature. In pattern feature you can use simple direction method to make simple fins of the same size. 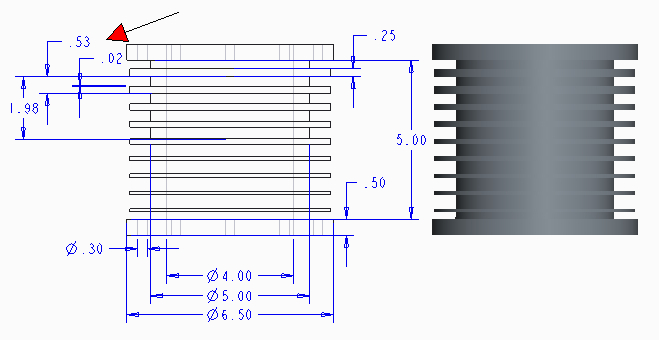 But if you want to create them with heat transfer point of view than the fins nearest to the hot area should be of larger width and as we move toward the cold end of cylinder fins width should be decrease. There is well explained theory behind this and we will not discuss it at the moment. When we will move toward simulate section then we will study in detail. I have attached the detailed drawing and final look of piston cylinder. The CAD modeling is left for you as an exercise. 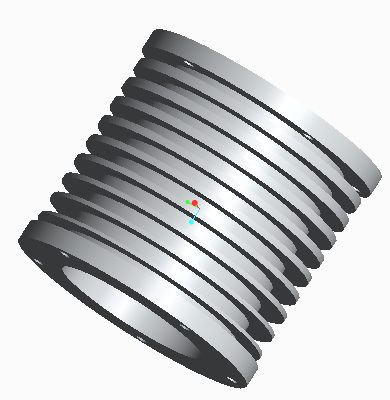 Make sure to create this piston cylinder as will use it in later tutorials. There is no restriction on method you choose for modeling. You can create it using different methods. As the part is simple so it will not create a problem.